VANCOUVER, BC, September 18, 2013. Mirasol Resources Ltd. (TSX-V: MRZ, Frankfurt: M8R)(“Mirasol”) is pleased to announce that it has signed a binding Letter Agreement with First Quantum Minerals Ltd. (“First Quantum”) (the “Agreement”) for the exploration and development of its 100%-owned, 13,659-hectare Rubi Property, located in the historic El Salvador copper-gold mining district of Region III, northern Chile. The Agreement provides for First Quantum to earn a 55% interest in the Rubi Property upon completion of a US$6.5 million investment in exploration over four years from the date of signing the Agreement, and a total of US $1.1 million in staged cash payments. The Agreement provides for exploration expenditure commitment during the first year of US$1.5 million, to include a commitment for magnetic survey of the claims and 3000m of drilling. After earn-in, First Quantum’s participating interest may be increased to 65% on completing a N.I. 43-101 compliant resource estimate and PEA (Preliminary Economic Assessment) on a minimum size resource of 1 million tonnes of contained Cu. First Quantum may further increase its interest to 75% by declaring a “decision to mine”, and will provide mine financing at commercial terms if requested by Mirasol. Financing terms include interest calculated at LIBOR+4% and repayment of Mirasol’s proportional mine finance from 50% of cash flow. “Mirasol’s management is pleased to have First Quantum, a highly respected metals miner, as our partner for exploring the Rubi Property”, said Mirasol’s president and CEO, Mary Little. “First Quantum brings valuable local expertise and capability for future project development. We look forward to an exciting and productive association with First Quantum in Chile”. The Rubi Project was identified and staked by Mirasol through its Chilean project generation program (see news releases of November 26, 2012 and June 12, 2007). Rubi is located within the premier porphyry belt of northern Chile that hosts many world class porphyry copper deposits. The Rubi Project is centered within a regional cluster of large, gold-bearing porphyry copper deposits (Figure1) including the 3.8 Bt El Salvador and 1Bt Potrerillos districts as well as the 770 Mt Inca Del Oro mine development. Mirasol’s exploration has identified a number of discrete priority drill targets at the Rubi project. These include the 9 sq km Lithocap prospect defined by a large area of untested anomalous copper, molybdenum and gold geochemistry; the underexplored porphyry stockwork zone at the Portezuelo project that received limited shallow drilling in the 1980’s but has seen no modern exploration; and the untested gold–silver vein target at Quebrada del Salado. Additional conceptual gravel covered copper targets exist at Pampa del Inca and Corner Zone prospects. Mirasol is a well-funded exploration and development company focused on the discovery, exploration and acquisition of high-potential precious metals deposits in the Americas, utilizing leading edge technology for strategic advantage. In December, 2012, Mirasol sold its interest in the Joaquin Silver project to Coeur Mining Inc., for a value of US$ 60 million in cash and shares. 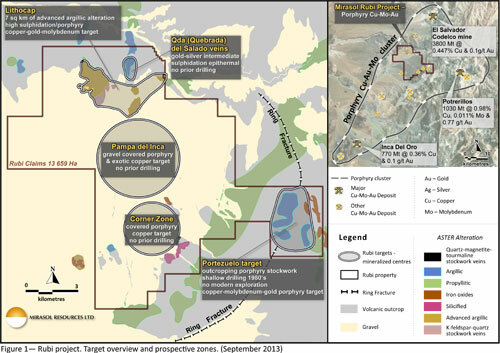 Mirasol holds 100% of the rights to the Rubi copper-gold porphyry target, strategically located in the historic El Salvador copper mining district, Chile, and has identified, trenched and drilled 100%-held, high-sulphidation gold exploration targets in a new district of northern Chile, including the Titan and Atlas properties. Mirasol operates through subsidiary companies in Chile and Argentina is engaged in generative exploration in high-potential regions in the Americas. Exploration at Mirasol’s Rubi Project is supervised by Stephen C. Nano, Vice President of Exploration, the N.I. 43-101 qualified person for Rubi, and Timothy Heenan, Exploration Manager. All technical information for the Company’s projects is obtained and reported under a formal quality assurance and quality control (QA/QC) program. Drill core, rock chip and stream sediment samples are collected under the supervision of Company geologists in accordance with standard industry practice. Samples are dispatched via commercial transport to an ISO 9001:2000-accredited laboratory in Chile for analysis. Results are routinely examined by an independent geochemist to ensure laboratory performance meets required standards. Assay results from surface samples may be higher, lower or similar to results obtained from drill samples.